So far, I have looked at Joanna’s and Beverly’s ThruLines. It took two Blogs to write about Beverly’s Thrulines. I wrote about a ThruLines match showing my connection to Michael Frazer of the James Line, but that match disappeared. 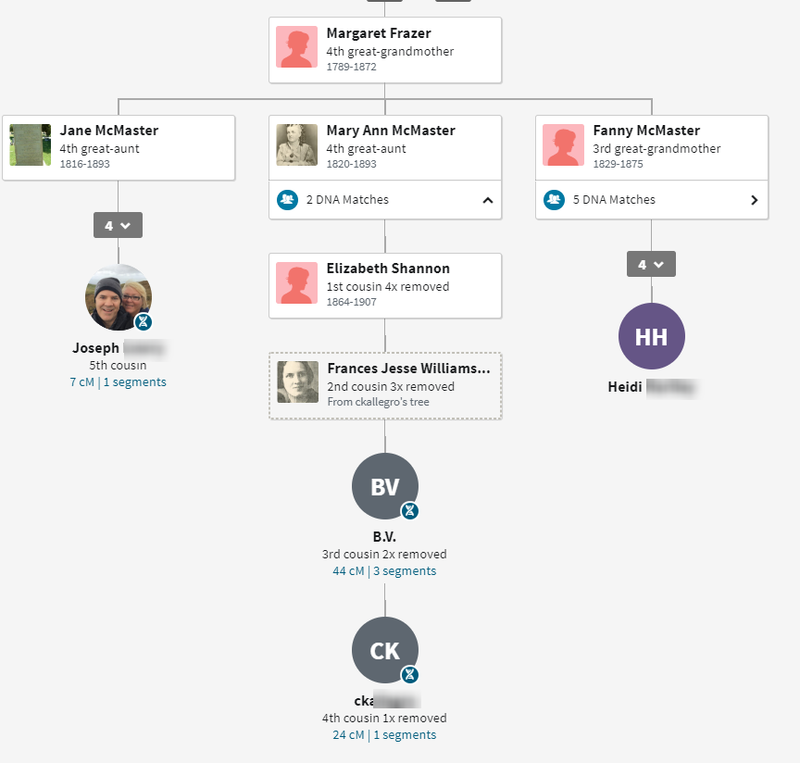 I wrote another Blog about the connection of my fourth great-grandmother Margaret Frazer to Michael Frazer. I started looking at James Frazer Line ThruLines as I thought they might be easier, but it resulted in a lot in information and I discovered new branches of DNA matches. 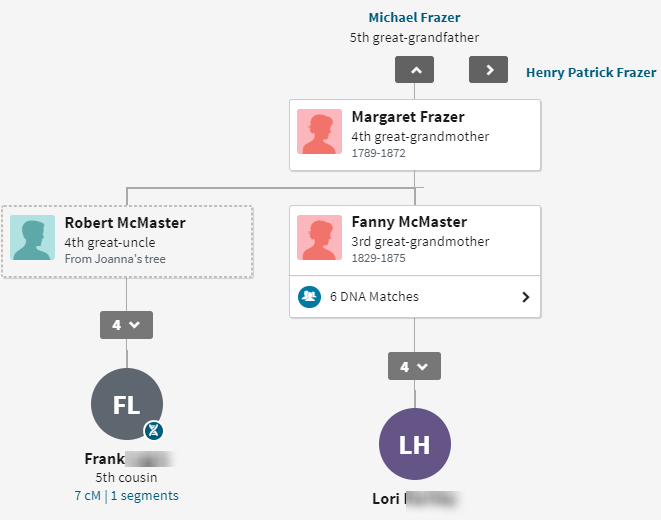 My James Line connection would be through the unproven connection between Margaret Frazer and Michael Frazer. Then Michael is the son of James Frazer. This is a little confusing and ambiguous. 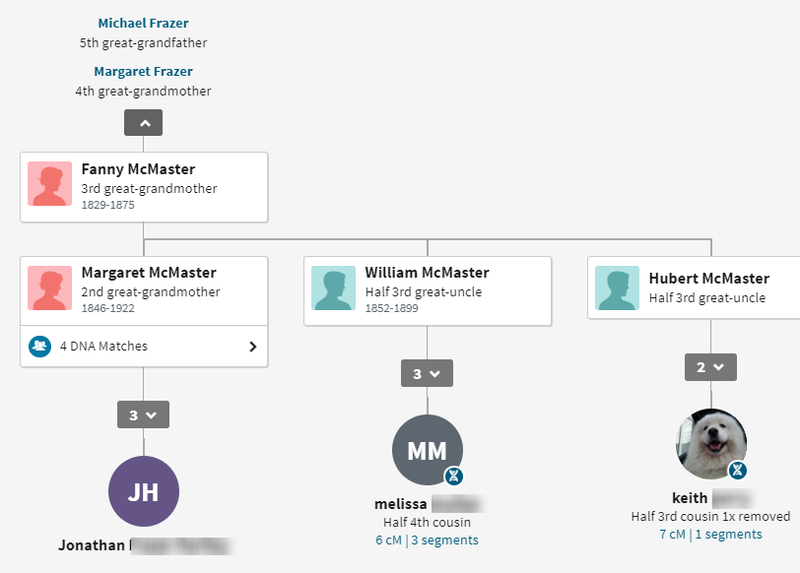 It’s confusing because I should be a full 3rd cousin once removed to Keith. 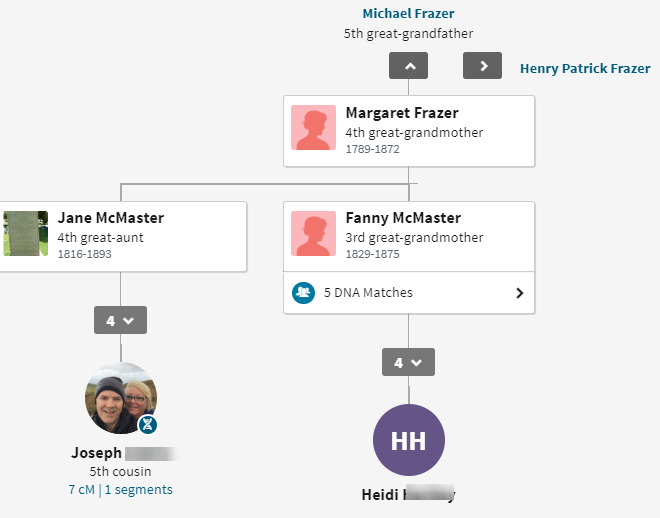 The ambiguous part is that I have Fanny descending from Michael Frazer, but I Keith and I are also related on Fanny’s husband’s side James McMaster. The match doesn’t show there because Keith and I perhaps have slightly different information on James. This is one generation up from Heidi’s and my common ancestor with Keith. The DNA match doesn’t show that Heidi descends from Michael, but the tree evidence shows that. Heidi’s next match is with a descendant of Henry Patrick Frazer who I wrote extensively about in one of my past ThruLines Blogs. 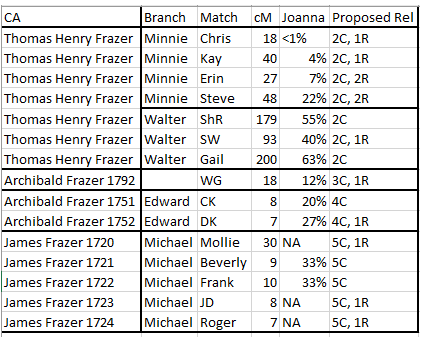 This match gives DNA evidence and tree evidence that Margaret Frazer was the daughter of Michael Frazer and a brother of Henry Patrick Frazer. This is not DNA proof, because the tree could still be wrong and the DNA match could belong to a connection between Heidi and Richard on a completely different line that we are not aware of. However, the DNA evidence gives us confidence that we are on the right track. Melissa’s tree goes up to her grandmother Joan and my tree goes down to Frances. ThruLines has stitched the two trees together. 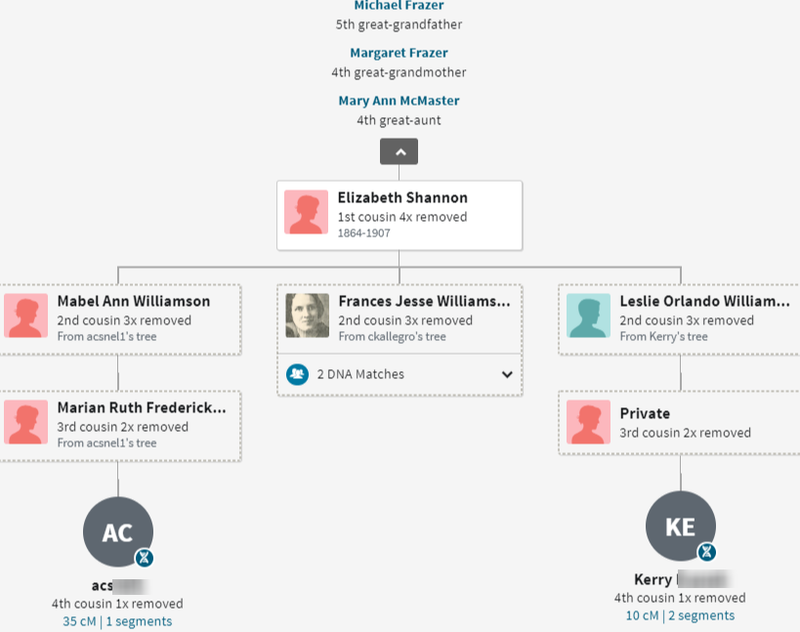 ThruLines are good in that it forces you to check the genealogy. I can either start a new tree for Melissa, or bring my tree down. I’ll try going down to see if I can match up with Melissa. However, a problem with doing this is that even if I do connect with Melissa, it could be on two lines. William McMaster married my great-grandmother’s sister Catherine Clarke. I circled Scotland, because this is not right. Frances’ mother was born in Ireland. 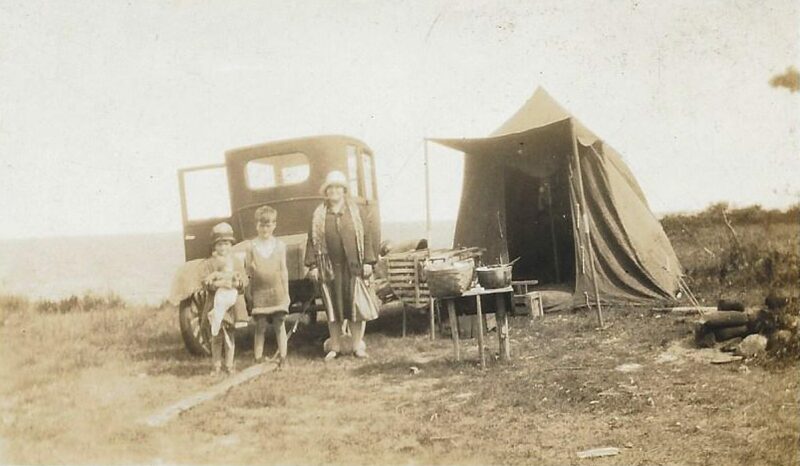 There was some stigma about being Irish that some families’ shied away from. 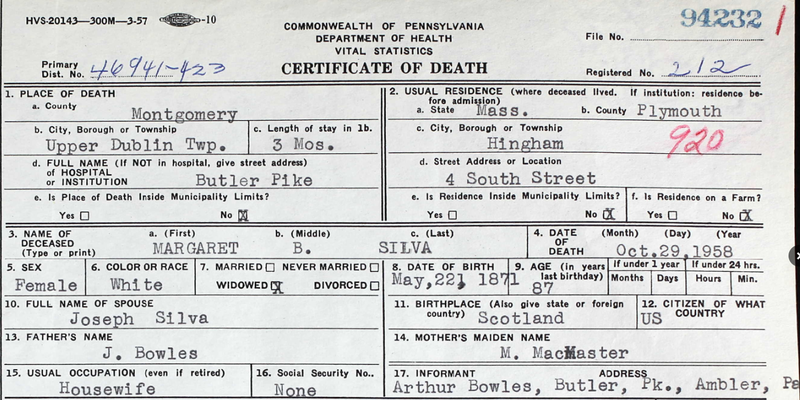 Actually, Frances’ father was also born in Ireland and the Census says he was born in Massachusetts. Right away I see in Melissa’s tree that Joan is Joan Clark Butler. The Clark is a giveaway that we are related as William McMaster married Catherine Clarke. 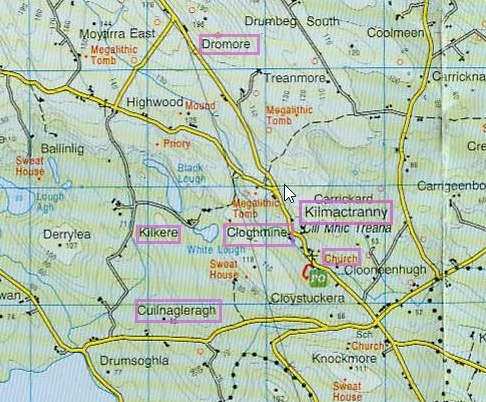 The ‘e’ in Clarke went away after the family moved to the US. Here we see Hubert McMaster. Hubert was Frances’ older brother born in 1889. This shows that the trees match up. However, I can’t tell if the DNA match is on the McMaster side or Clarke side. Melissa would have to upload her DNA to Gedmatch to check that. Even then it may be difficult to tell. BV is Jon’s 3rd cousin twice removed. 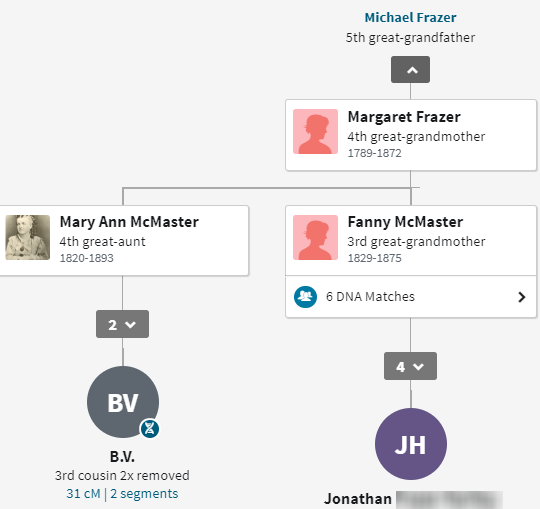 Mary Ann McMaster is the sister of my 3rd great-grandmother. She recently showed up when I asked Cheryl (who does the family research) to take out the space between the Mc and Master that used to be there. Actually this ThruLine showed up as I was writing this Blog. The same is true on my matches except I have a larger match. The Private people are from Joanna’s tree. I might as well create a new tree for Frank and see where it goes. 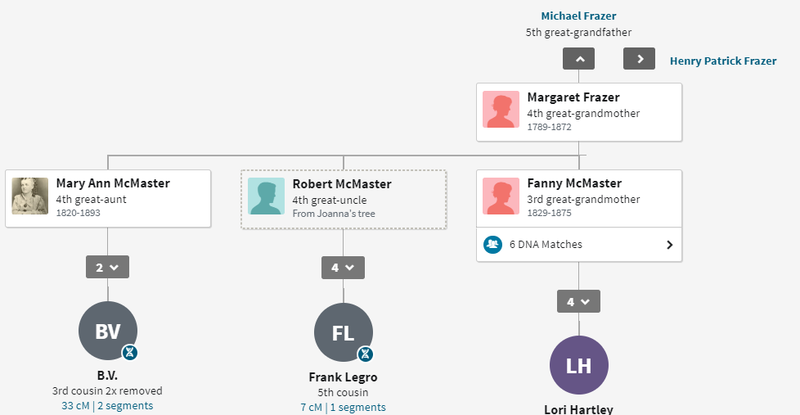 Interestingly, Ancestry pulled in Lillian above from another tree than the one that Frank’s DNA was attached to – perhaps a tree of a child of Frank. Because Frank’s tree only goes up to his mother. That is helpful, Ancestry. This Census looks like it was done in smudgy pencil. Here James Bowles is still alive. This shows that everyone’s two parents were from Ireland. I also brought in the information on naturalization in the last two columns. Frank’s tree mentions the 1901 Census for Scotland. 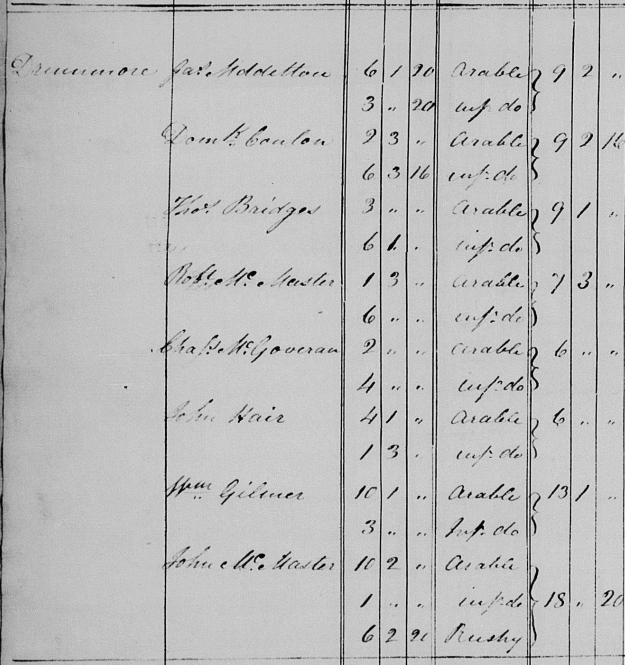 In that Census all in the family were from Ireland except for Lillian. She was born in Scotland. Their three-year old son Robert was born in Ireland. That means that the family left for Scotland around 1899. This shows that she usually lived in Hingham, MA. 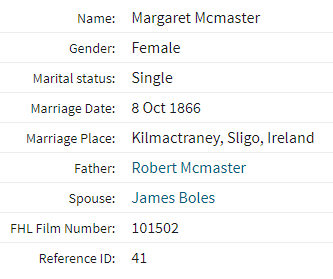 Her mother is listed as M. MacMaster. This gives me the evidence I need to confirm Frank’s son’s tree. I want to make sure that I get Margaret right, because she is the one I am looking for. The first record is for my second great-grandmother Margaret. The second record is Frank’s 2nd great-grandmother Margaret. Shows that Frank and I have something in common. Perhaps Robert was another son of John. The evaluation shows a John and a Robert McMaster living in ‘Drummore’. Ages given at burial can be way off. If it is right, Robert would have been born 1803. The note is by the researcher and transcriber. If this is Anne Shannon, then my birth date and marriage for John could be wrong. That would put her birth at 1771. She would have been 47 at the birth of Margaret. Let’s say she was born in 1776 and she was 42 at the birth of Margaret. Let’s also assume that she was the mother of Robert and that he was either 80 or 85 when he died. That would mean that Anne would have been betwee 27 and 32 yeaers old when she had Robert. This is a lot of supposing. 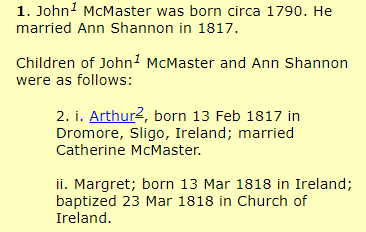 My top guess is that Robert was the son of the John McMaster shown from my web page above. In addition, Lori has a match on the Henry Patrick Frazer Branch. This is important, because the other matches could be on the McMaster side. 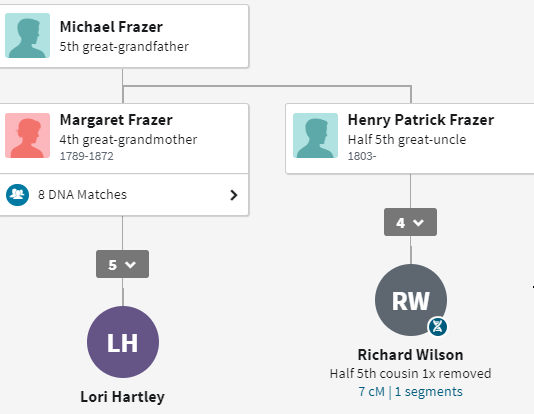 I have gone over the Henry Patrick Frazer genealogy in a previous Blog and the connection looks good. The DNA match is small as one might expect. This is the family in Lane Tree, Contra Costa, CA in 1900. So far only, Mabel from the tree above has been born. Now we see Francis and Leslie. Sharon’s new-found matches with AC and Kerry check out fine. It’s a good idea to check because sometimes there are mistakes. 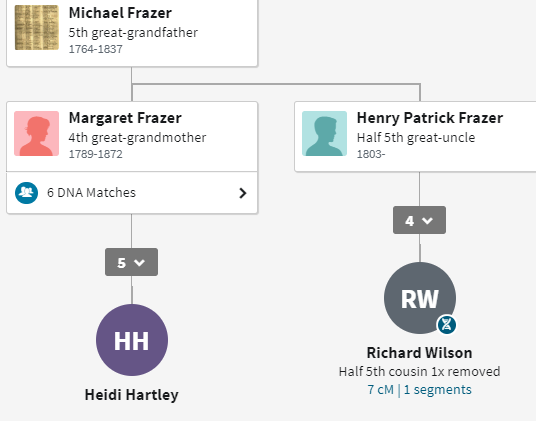 The ThruLines show our ancestry going up to Michael Frazer. This connection is strongly suspected, though not proven. I want to summarize the DNA matches for all the ThruLines to get a feel for the probabilities of the DNA matches. This could be important when looking at relationships that are less probable. The match is even a bit high as it would be a little more likely to be a 4th cousin (at 22%). Note that the top % is now 33%. That is because it is more likely to have a smaller match at this level of relationship. The reason that I have the top % is to see how high the scale goes for a given DNA match. I don’t agree with the last two results. 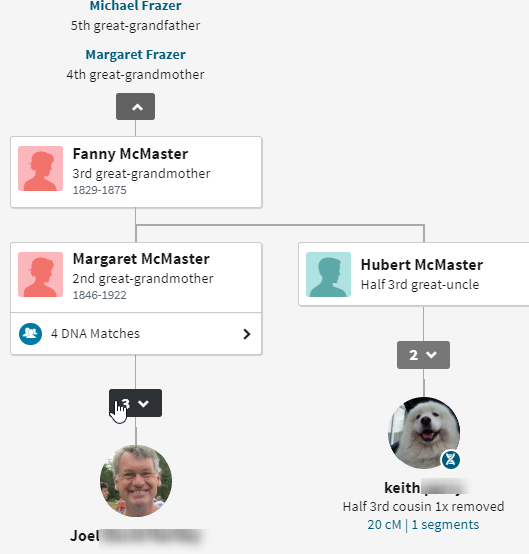 Keith may be shown as a 1/2 3rd cousin because I have Fanny as the husband of James McMaster Sr. Perhaps the senior is throwing off Ancestry. The ThruLines do show that there is a 22% chance that the match would be a 1/2 3rd cousin. Jon’s match with Melissa was a bit unusual. Jon had a 6 cM match with Melissa in three segments. So those are tiny segments. He should match her equally on the Clarke Line, so that could explain the number of segments. That would make them double 4th cousins, but I don’t think Ancestry accounts for that. Note that as the relationships get further away, the percentages get higher. I have noted this same effect in at least one other ThruLines analysis for Joanna. Then at the level that I’m trying to prove ancestry, the percentages disappear, because the relationships are too distant (beyond fifth cousin). When I did Joanna’s chart I didn’t include the maximum percentages. 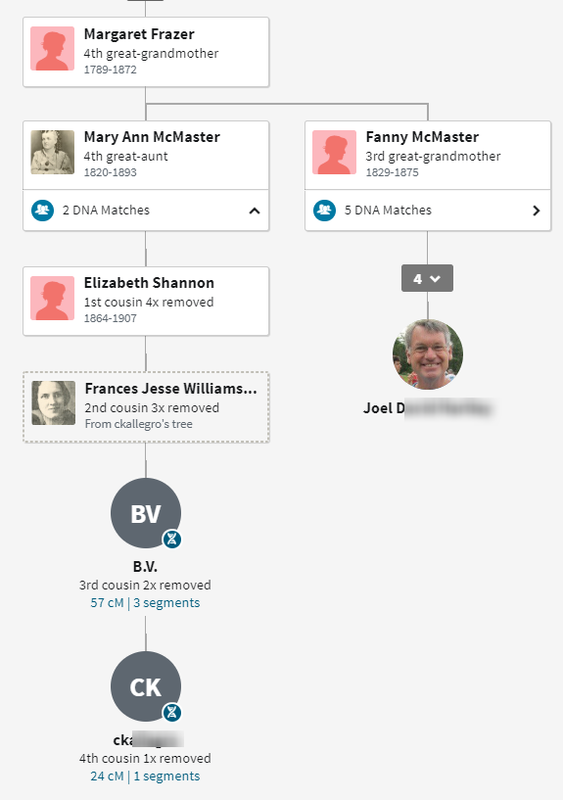 Here Joanna has more matches in the 2nd cousin range compared to my family. 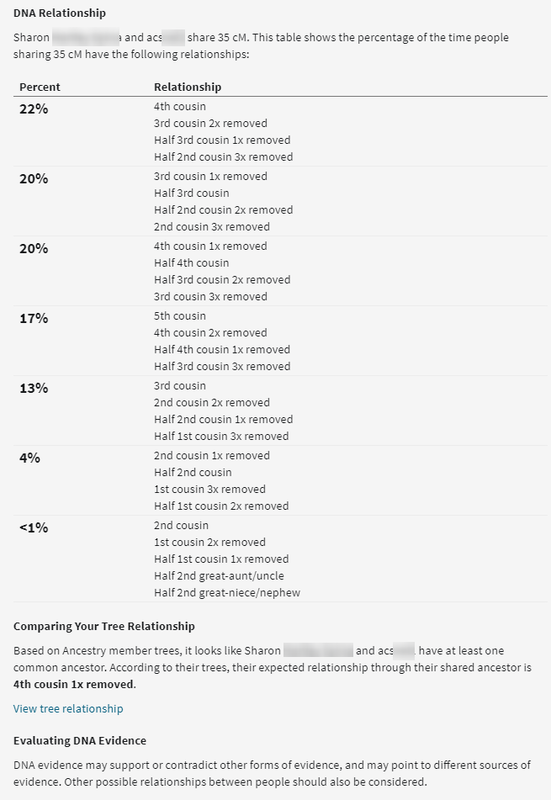 However, if you look at Joanna’s results starting with her third cousin, once removed match, her results go from 12 to the 20’s for her fourth cousins to 33% for her 5th cousins. That seems to be consistent with my results. Most of my family’s Michael Branch Thruline matches are through McMaster. These matches don’t add as much evidence as the more distant matches. Heidi and Lori have 7 cM matches with Richard who descends from Michael Frazer. 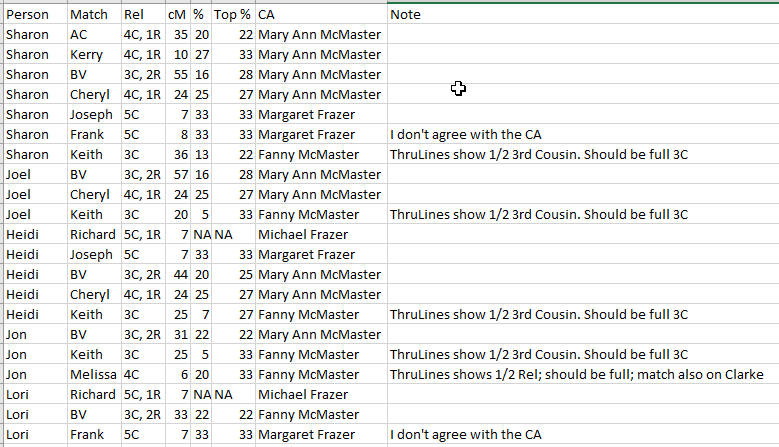 This is probably a non-McMaster match and adds evidence that Margaret Frazer is the daughter of Michael Frazer. 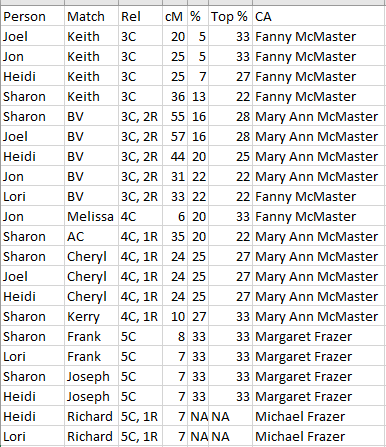 I looked at all the cM matches with the Ancestry ThruLines percentages to get a feel for the numbers. I also looked at the maximum percentages for the given match level. I sorted these matches and saw that the percentages got higher as the relationships got further out. I had noticed this happening with Joanna’s results from a previous Blog. Some ThruLines are not as they should appear as I disagree with the common ancestor and/or ThruLines shows a half relationship where I think there should be a full relationship. It may be possible to fix these issues, but I’m not sure how to do that right now. It may involve correcting other people’s trees. It was interesting to see in my family with 5 siblings tested at AncestryDNA how the ThruLine results differed for each sibling while just looking at one Branch and one common ancestor.